I had eluded to a new project a few posts ago... well this was it! Woven co-authors Michael R. Jensen and David Powers King approached me to create an alternative book cover for their book. 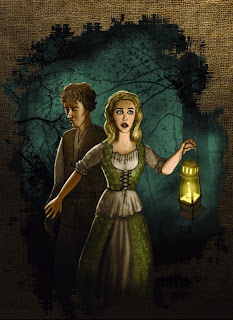 The illustration features the two main characters of the book- the princess and the ghost. They didn't want to use any convention of transparency with the ghost- and he seems very real to the princess, but I convinced them that a visual cue was needed... so he gradates out. I wanted to create that classic YA fantasy feel- somewhat like traditional animation... "Disneyesque" in it's appearance. I liked the way it turned out. I had severely limited time- so I had to turn to some quick techniques to deliver. I used a forest texture brush for the background, I drew the figures separately, scanned, and colorized in Photoshop. There's quite a bit of head space- that's for the title. 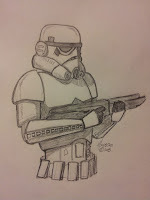 Some Star Wars fan art! Here's some Star Wars fan art (or rather portrait studies) that turned out pretty good! All content is ©Copyright 2017 Juan Maestas. All around creative-type; for better or worse.